If you’re reading this post, chances are that you have been struggling to get a good night’s sleep, have noticed that you are constantly feeling fatigued, and your partner has been complaining that your consistent night-time snoring is disrupting their sleep. As a result, you’re now worried that you may be suffering from Sleep Apnea. Considering that the sleep disorder causes various underlying health problems, it is vital that you learn about the condition’s symptoms and determine whether or not you need medical assistance. If you constantly wake up feeling tired despite spending 7-9 hours sleeping throughout the night, you may be suffering from the side-effects of sleep apnea. This is because a person suffering from the sleep disorder experiences frequent pauses in their breathing while they sleep. Each time a sleep apnea event occurs, blood oxygen levels drop and the brain partially wakes up in order to “jump start” the body’s respiratory system and restore regular breathing. These frequent sleep interruptions negatively impact the quality and amount of sleep you get. Thus, you feel tired and sleepy throughout the day. As noted, each sleep apnea event drastically reduces the amount of oxygenated blood reaching the brain. As a result of low oxygen levels, blood vessels in the brain instinctively widen. Each time this happens, you are more likely to wake up with a vascular headache and experience excessive daytime drowsiness. Although it is common for most people to wake up feeling slightly thirsty, individuals with sleep apnea wake up feeling desperately thirsty because they have spent most of the night sleeping with their mouths open. Sleeping with your mouth open is a result of the body’s natural reaction to the condition’s symptomatic breathing breaks and pauses. 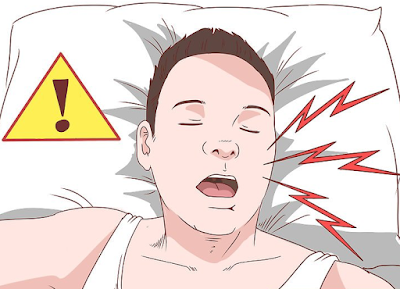 Unlike normal snoring which typically occurs when you have a cold, fever, or are just plain drunk, snoring caused by sleep apnea tends to be chronic (every night) and extremely loud. If your partner consistently tells you that you snore and gasp each night, you are probably manifesting the physical symptoms of sleep apnea, that is, interrupted breathing during sleep. People with the sleep condition frequently find themselves feeling irritable, short-tempered, depressed, prone to anxiety, or moody for no particular reason. These are the most noticeable psychological symptoms of sleep apnea and are caused by incessant lack of quality sleep. Psychosomatic symptoms are thought to be the most damaging as they affect an individual’s professional and social life. do you snore and gasp each night? do you frequently wake up with a headache and dry mouth in the morning? do you constantly feel tired and sleepy throughout the day? are you irritable, short-tempered, or moody during the day? If your answer to most of these questions is yes, it is highly advisable that you seek medical attention in order to get a professional diagnosis.